I bought a used race car about a year ago. It has the RacingBeat Holley Carb, Intake, and Headers on the 12A motor. 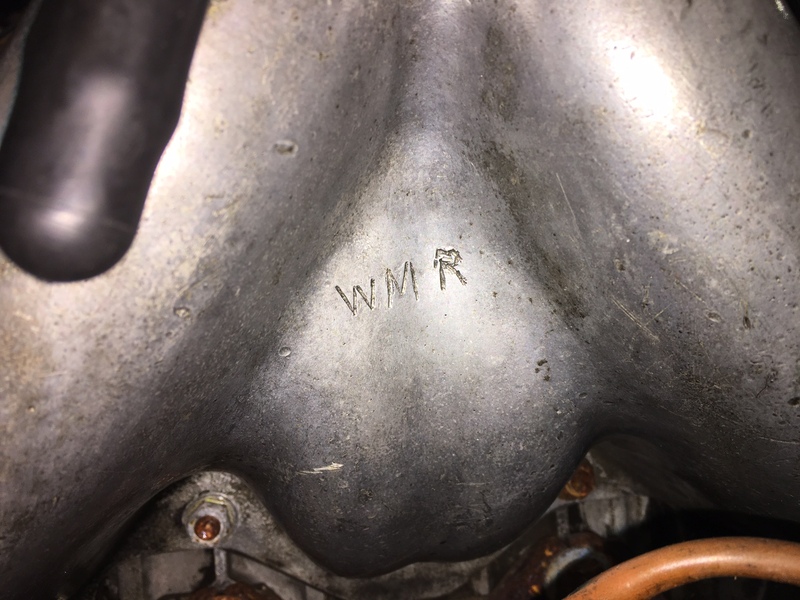 I recently pulled the carb off to rebuild and freshen it and I noticed there are 3 letters carved beneath the carb on the intake on the passenger side (see photo). This may just be the initials of the pervious owner but I thought maybe there is more to the letters (WMR). If you guys know let me know. WMR or the Wellington and Manawatu Railway Company was a private railway company that built, owned and operated the Wellington-Manawatu railway line between Thorndon in Wellington, the capital of New Zealand, and Longburn, near Palmerston North in the Manawatu, between 1881 and 1908, when it was acquired by the New Zealand Government Railways. Its successful operation in private ownership was unusual for early railways in New Zealand. At the time of the company's founding in 1881, the government had built the Foxton Branch railway linking Palmerston North and Foxton, and had completed surveys of lines down the west coast to Wellington. The government of Sir George Grey had approved the construction of the line, which was included in the Public Works Estimates of 27 August 1878. The final details of the survey were completed, and the first workers for the construction of the line were hired on 21 August 1879. A short section of the line, from Wellington to Wadestown, was partially constructed. However, Grey's government was defeated at the September 1879 general election and left office in October 1879. The government of Sir John Hall took office and he had the line removed from the Public Works Estimates. Hall then created a Royal Commission to review the government's public works programme, with a view to reducing government expenditure. The Commission reviewed the Wellington-Manawatu line in March 1880, and concluded that work should be abandoned. Backed by the Wellington Chamber of Commerce, a group of prominent Wellington businessmen decided to form a company to fund the railway's construction. They did so on 15 February 1881, issuing 100,000 shares at £5 each. By May 1881 43,000 shares had been sold, including a substantial package to Māori land owners in the Manawatu, who exchanged land along the proposed route for shares in the company. In May 1881 the company signed a contract with the government to purchase the land, formation and materials used for building the line so far. The government made certain undertakings limiting the company's profitability and dividend payments, and made substantial grants of Crown land (210,500 acres or 85,186 hectares) to prevent land speculation and make the railway a viable entity. The total land grants were valued at £96,000.00. The contract stipulated the line was to be built within five years of commencement. The contract also included a clause for the government to purchase the company in the future at a "fair value", something that was later to prove contentious. In August 1881 the Railways Construction and Land Act was passed, allowing joint-stock companies to build and run private railways, as long as they were built to the government's standard rail gauge of 1,067 mm (3 ft 6 in) and connected with the government railway lines. The Act had the effect of authorising the WMR's operations. Construction of the line recommenced on 25 September 1882. Construction was completed on 27 October 1886, with the first through train running on 3 November. The WMR was relatively successful, and generated considerable revenue. Its land holdings proved to be a major revenue stream for the company; as sections of the lines opened, the land value around it increased and thus the WMR profited from its own operations. The railway's operations were advanced by standards of the time, having comfortable carriages, dining cars, electric lighting, and telephone communication between stations. By comparison, the government-operated network did not introduce dining cars until 1902. The WMR was bought by the government in 1908 and integrated into the New Zealand Railways Department from Monday 7 December 1908. The WMR used simple unprepossessing stations, stating in 1893 that it does not build stations for future generations of travellers as our Government seems to – but adapts expenditure to actual requirements leaving additions to be made as wanted. Fourth Class (42 ft x 14 ft): Johnsonville, Paremata, Otaki, Shannon. Fifth Class (34 ft 8 in x 14 ft 9 in): Crofton, Khandallah, Porirua, Plimmerton, Paekakariki. Sixth Class (Flag) (about 15 ft x 8 ft): Tawa Flat, Plimmerton, Pukerua, Paraparaumu, Waikanae, Te Horo, Hadfield, Manukau, Ohau, Levin (original), Kereru, Makerua, Tokomaru, Linton. Last edited by FührerTüner; 10-24-16 at 01:16 PM.